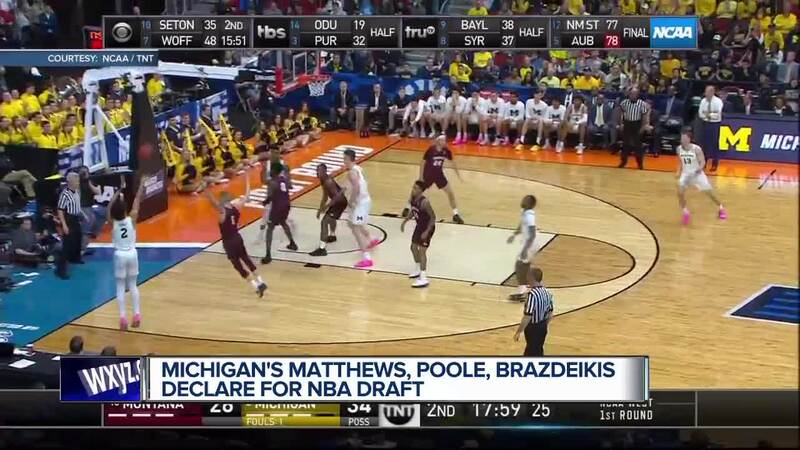 ANN ARBOR, Mich. (AP) -- Michigan's Charles Matthews, Iggy Brazdeikis and Jordan Poole are declaring for the NBA draft, although they can still come back to the Wolverines. "It was an amazing year for me in Ann Arbor," Brazdeikis said. "There are many things I still want to accomplish, and pursuing a professional career is just one of them. My family and I want to take full advantage of the opportunities to see where I fit in the NBA draft. It's an exciting time, and I just cannot wait to get started." "Being able to play in the NBA has always been my dream since I was young," Poole said. "I am confident that with my faith in God and hard work that I, and my family, are prepared to look at all options and make the right decision for the next step of my playing career."